ST PETERSBURG, May 25. / TASS /. 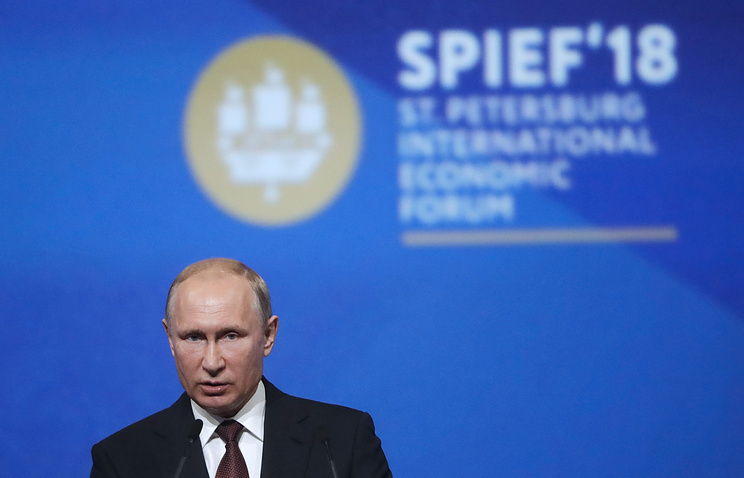 Russian President Vladimir Putin compared the economic sanctions to conducting a football game according to judo rules, when answering a question about the anti-Russian restrictions imposed by the West, at the 2018 St. Petersburg International Economic Forum on Friday. "The situation in the world is such that it is as though everyone is playing football, but at the same time, they are applying judo rules to it [the match]. So, we end up with this interesting game, it's neither football, nor judo. It's just chaos," Putin explained. According to the head of state, the "sanctions baton" is being used more often in the world, and not just in regards to Russia. President Putin emphasized that these sanctions and their effects are surmountable. He said that the Russian economy has already stabilized, despite the simultaneous fall in prices for exported goods, restrictions and other obstacles. "But we were able to travel down this path, and more than that, to a certain extent, we have strengthened our economy," he underscored. Putin noted that sanctions still bring loses to both sides and stunt economic growth, yet "at some point, a breakthrough does take place, solutions arise and everything seems to fall into place. Ultimately, such a policy makes no sense whatsoever; not on economic, political, or even military grounds," he said. Putin added that one of the reasons for containing Russia was the need to prevent the development of defense technologies. However, Russia has already "outstripped many partners" in this aspect, the president stressed with confidence. He referred, in particular, to the recently publicly demonstrated state-of-the-art domestic innovations in this area.